Until recently, the only alternative to getting rid of fat bulges was to undergo liposuction, a surgery that requires the patient be anesthetized and hospitalized for several hours, barring any complications. 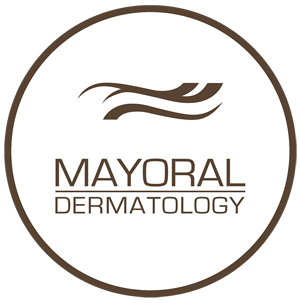 Several years ago, the FDA approved a new type of treatment for the elimination of fat accumulation that is noninvasive, more affordable and able to be done at our Mayoral Dermatology facility. Using a revolutionary cryolipolysis technology that is applied to fat cells with a device created by Dr. Scott Wolf, CoolSculpting by Zeltiq™ involves nonsurgical cooling of fat tissue to generate lipolysis, or the disintegration of fat cells without damaging neighboring tissues. Scientists initially researching the induction of lipolysis found that fat cells extracted of their heat energy produces a cooling effect that causes apoptosis, or cell death. This controlled type of apoptosis provokes the release of inflammatory chemicals such as cytokine that helps to eliminate aggregations of fat cells responsible for stubborn bulges. Fat cell lipids are than gradually discharged into the bloodstream and transported with help from the lymphatic system to the digestive system where they are efficiently eliminated. Supported by research results, investigators state that the controlled, prolonged cooling of tissues will induce reduction of fat cells and the ultimate disappearance of subcutaneous fat without harming the epidermis. Referred to as “selective cryolipolysis”, this is the technology that makes the CoolSculpting by Zeltiq™ procedure an excellent, painless alternative to liposuction. Patients do not need to perform any special pre-treatment actions prior to a CoolSculpting session. An special applicator is placed on the area requiring fat removal, such as the abdomen (for eliminating “muffin tops), and the cup touching your skin will begin to gently use vacuum pressure to pull targeted tissue into the cooling panels. This applicator is designed to deliver fixed conditions involving rapid, intense cooling that immediately cause fat cells to burst and die. After millions of these fat cells implode over a period of two to three months, patients start to notice a definite reduction in the thickness of bulges and fat rolls. The reason results are not seen right away is because lipids are flushed from the body according to each patient’s metabolic rate. Consequently, people with higher rates may experience results faster than patients who have slower metabolic rates. A few minor side effects may occur, primarily from the vacuum effect–redness, numbness or negligible bruising. An analysis of peer-reviewed, academic journal articles reveals that researchers have ample ultrasound and photographic evidence to support the efficacy of cryolipolysis as well as statistically significant proof that there is an absence of abnormalities regarding liver functioning or lipid levels. It is not yet completely understood how the mechanism of action behind CoolSculpting eliminates fat cells but research and patient testimonies have clearly demonstrated the capacity for this noninvasive procedure to eliminate fat bulges and literally “sculpt” the body into a more desirable, attractive shape.